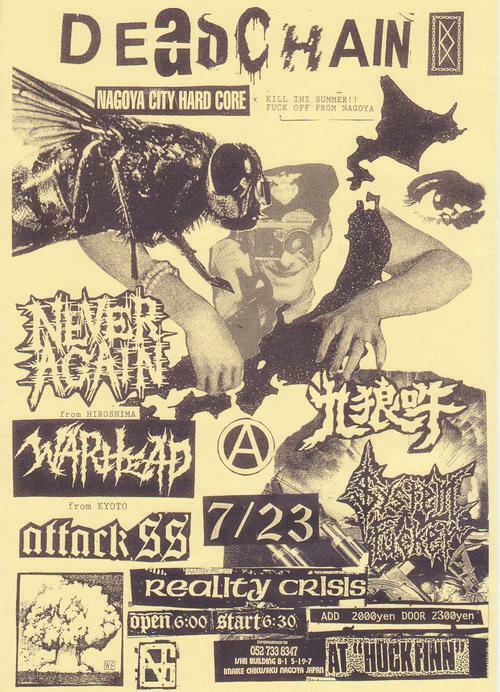 today, i went to Nagoya City for getting some records! firstly, i went to Records Shop Answer to getting a new ELEKiDZ single! but, unfortunately, it was already gone when i asked aboout it! then, went o another shop called Sound Bay! unfortunately, ELEKiDZ single was not there, too. 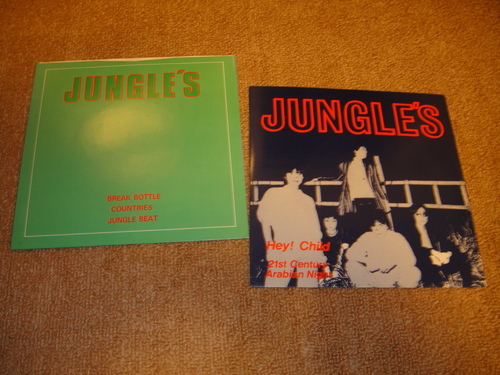 but i found a 2 singles of old Japanese punk band JUNGLE'S on deadly cheap! i was so happy to getting ones! oh, it was both on mint if you care. ten, when i was checking LP corner out, i found a guy who was wearing ELECTRO HIPPIES t-shirts! he was my very old friends. then, he told me someone sold 2000 copies of punk records on another second hand shop! so, i decided to go to there straight off, and went to there with him. i was very looking forward to getting some records @ another shop even though many of records were already gone! well, i'll talk about it next time! it was boring fxxking weekend! but this weekend should be great! so, it's DEADCHAIN @ Huck Finn!